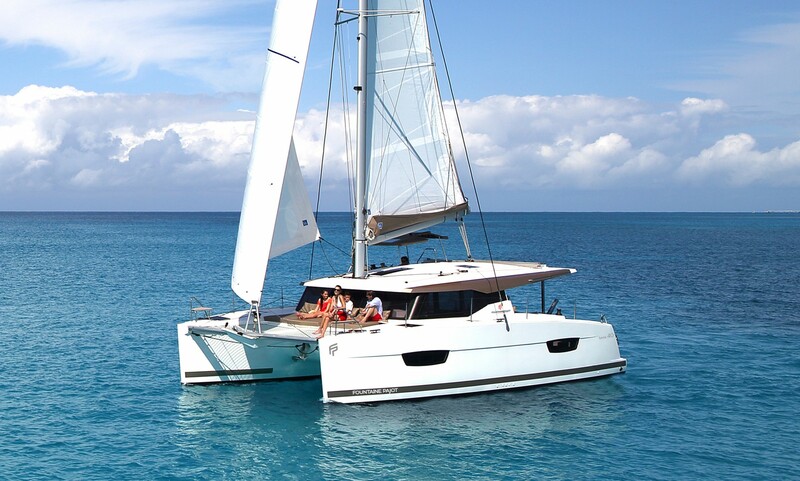 Well appointed and rewarding to sail. 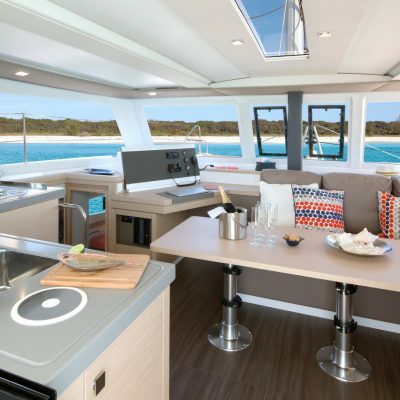 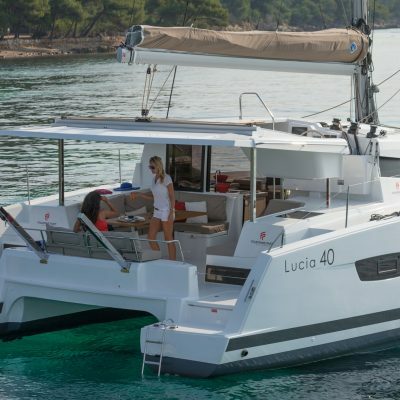 Fountaine Pajot’s Lucia 40 is a true revolution in her class. 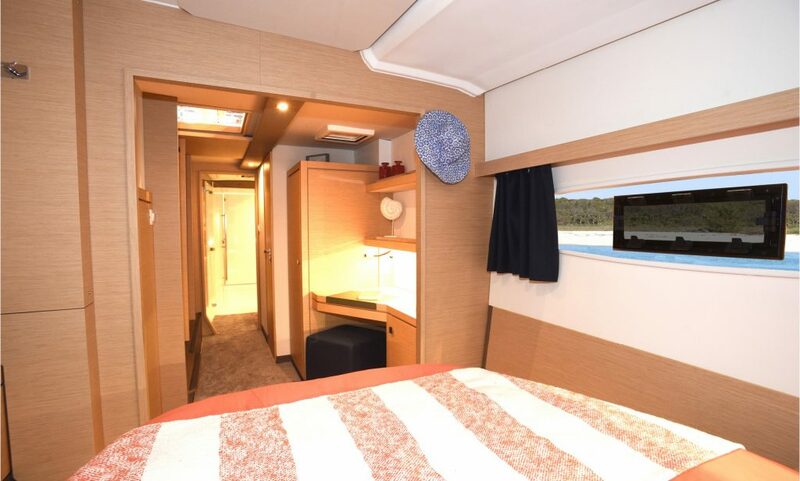 She has fabulous living space which includes a voluminous saloon, generous cabins, expansive cockpit, and a decadent lounge area on the bow. 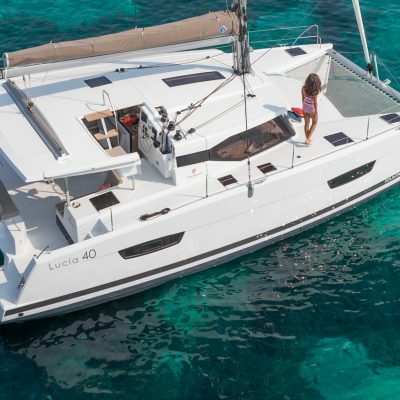 She is actually bigger than the Lipari 41 that she replaced. 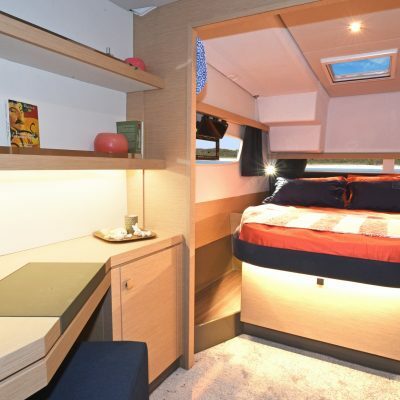 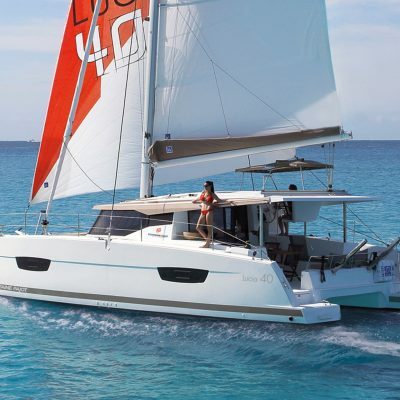 The only 40-foot sailing catamaran with an option of four bathrooms in the Quator version and also boasts one of the largest Owner’s suite available in the Maestro (3 cabin) version. Wide swim steps give easy access to the strikingly spacious 130 square foot cockpit. 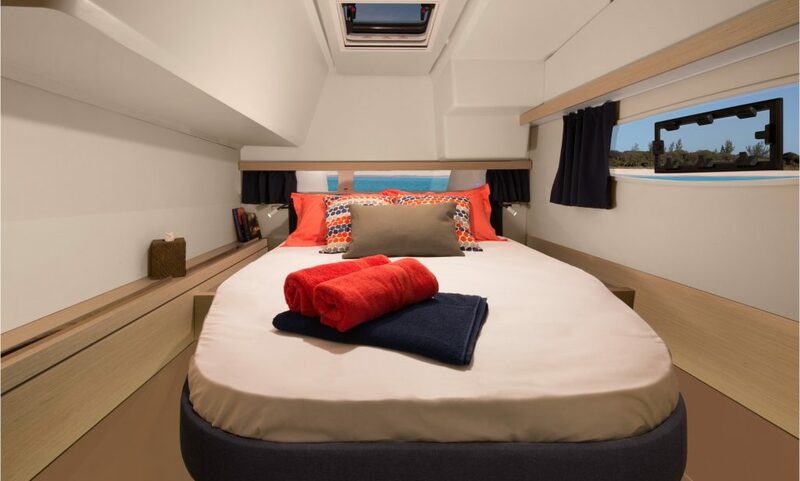 The coach-roof angles down as it swoops forward which not only looks sleek but gives excellent visibility from the elevated helm. 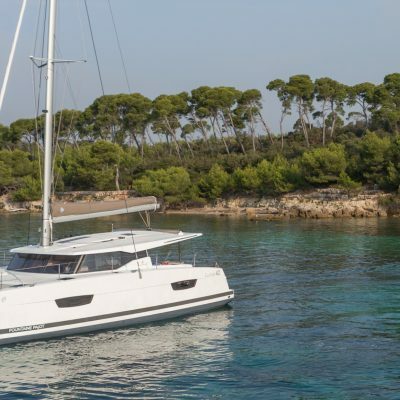 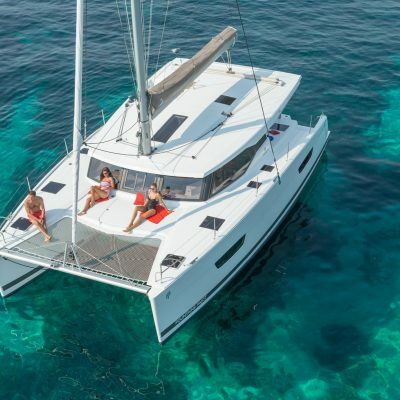 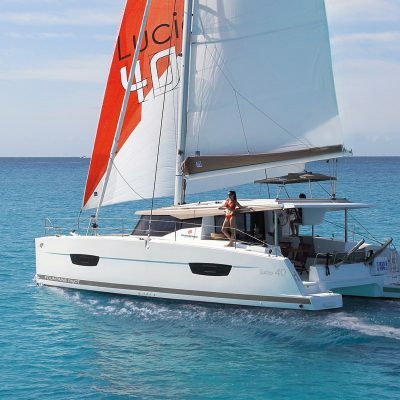 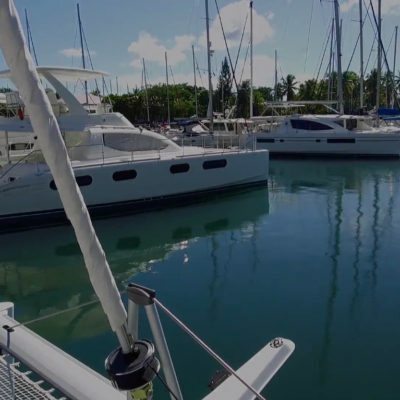 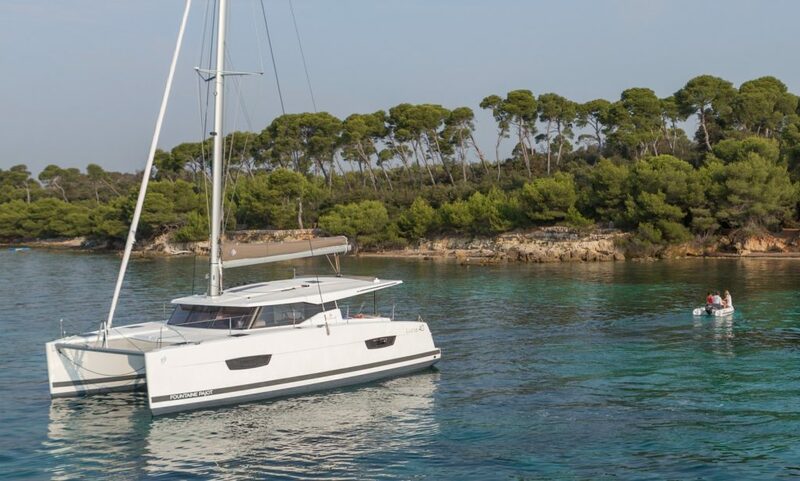 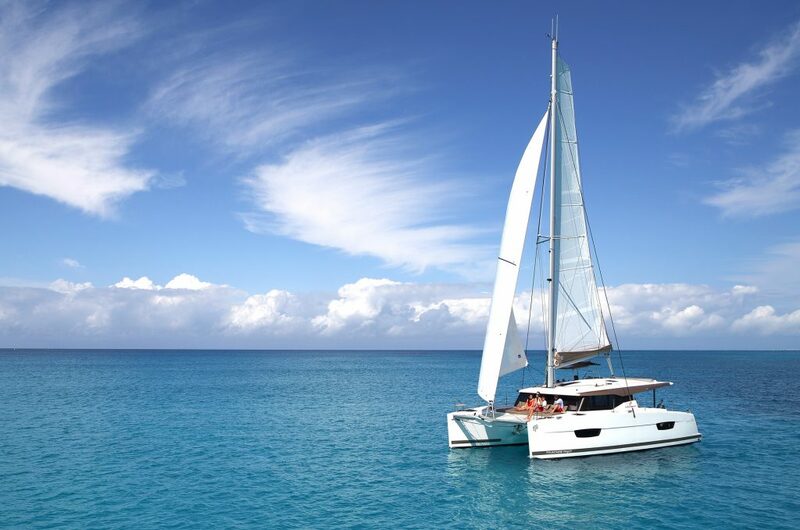 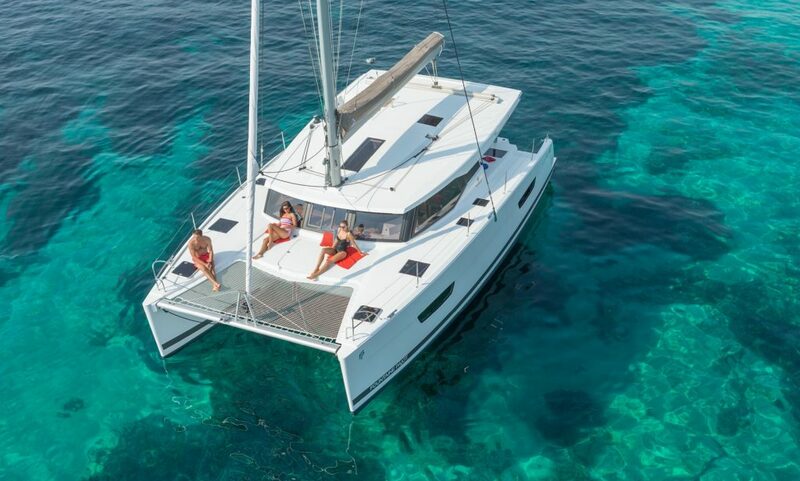 The Lucia 40 is a perfectly sized catamaran that will appeal to couples and families looking for the versatility of a multihull and carefree cruising, whilst keeping costs down. 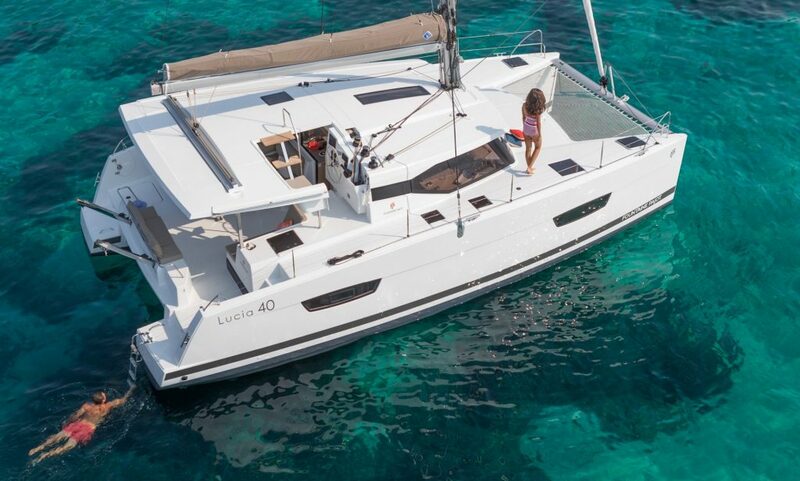 If you would like to find out more or buy a Lucia 40 please contact us here, or email Robin Hodges our yacht sales manager at robin@horizonyachtcharters.com . 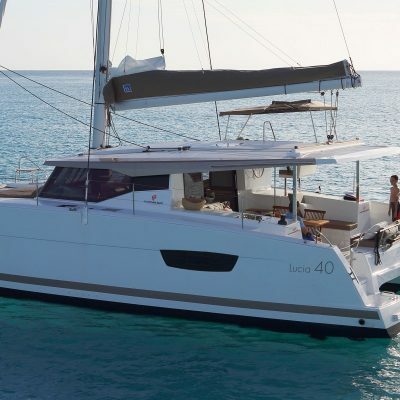 Or please scroll down to read more about this remarkable catamaran. 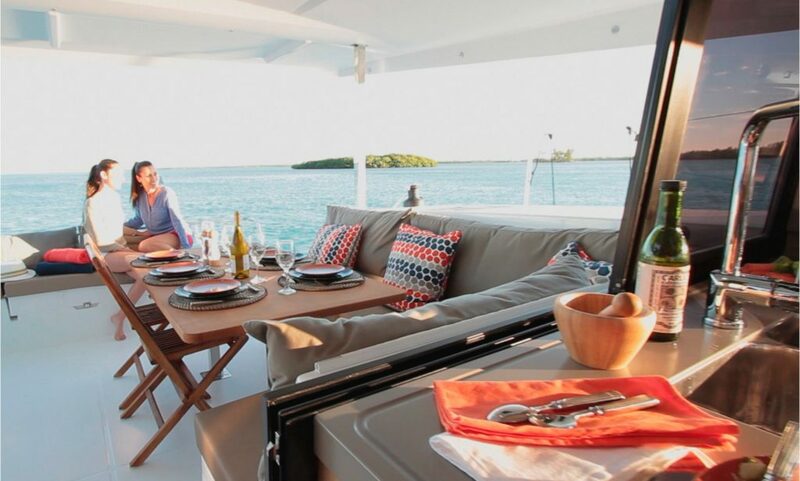 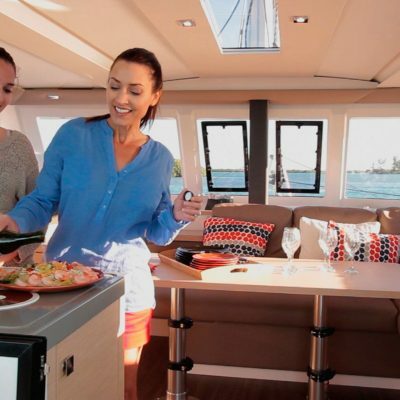 The stylish 130 square foot cockpit is entirely protected by the composite bimini and the port side seating around the cockpit table can accommodate eight. 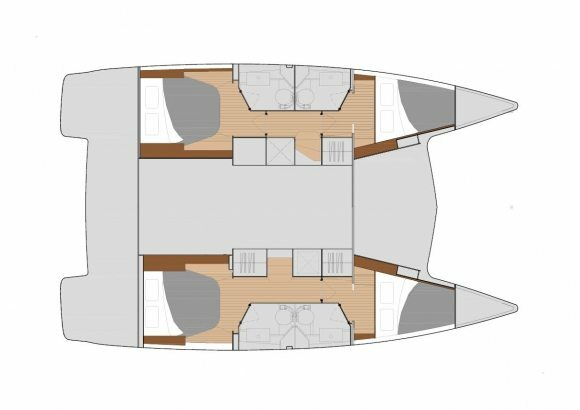 There is additional seating along the transom and on the starboard-side lounge. 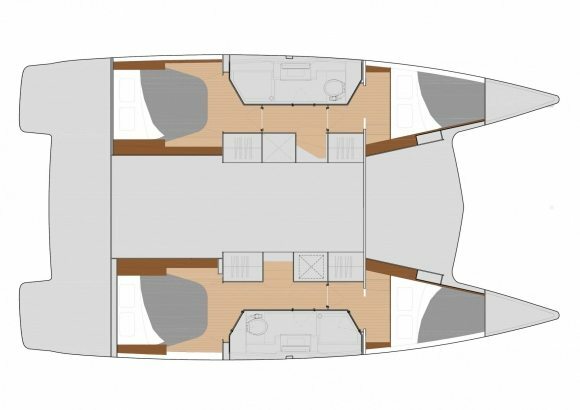 It is incredibly spacious and feels like a cockpit from a much larger boat. 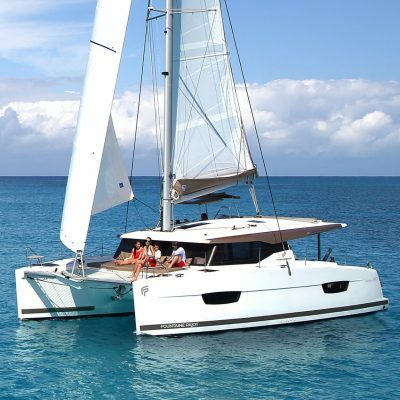 The raised helm-station is integrated with the cockpit but is elevated and molded into the bimini with easy access from the deck as well as via a set of steps from within the cockpit. 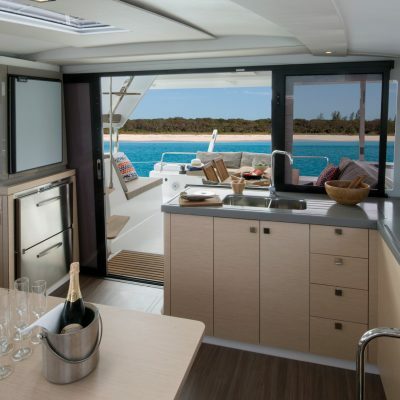 The Navigation instrumentation and sail controls are neatly laid out and easily used by skipper and crew. 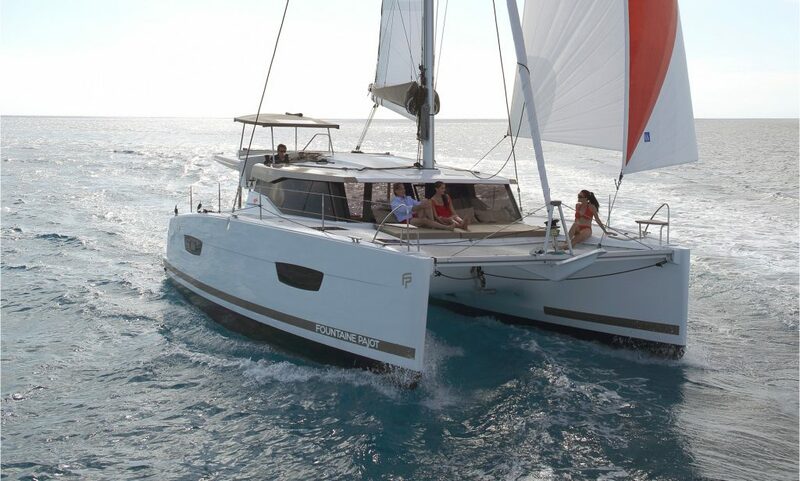 The helm-station has plenty of room for two to work simultaneously. 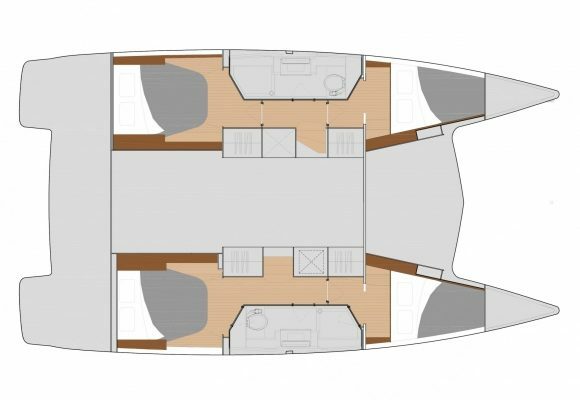 A small set of steps leads up to the coach-roof giving easy access to the relatively low boom, which makes mainsail stowing effortless. 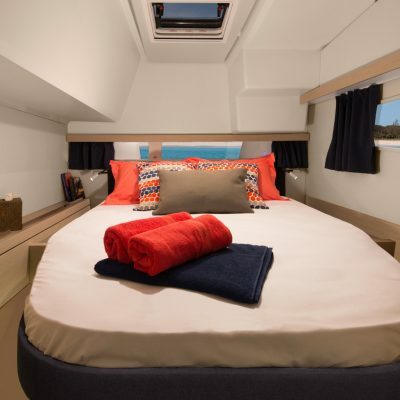 Forward, there is a large optional sun pad “lounge” that spans the front of the coach roof, and the trampoline is one single piece between the hulls with the central strut removed making it a comfortable relaxation area for sun-worshippers. 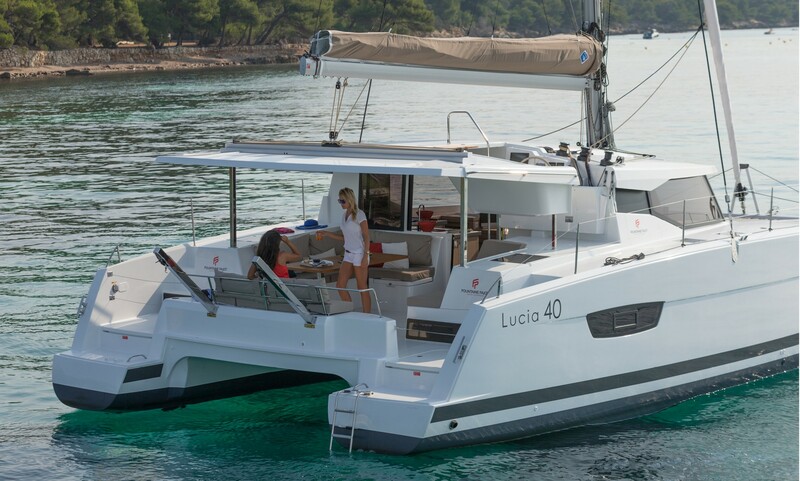 Beautifully appointed, the Lucia 40 is available in two basic versions, a three-cabin Maestro, and a four-cabin Quatuor, but with four different layouts (with three or four cabins and two to four heads). 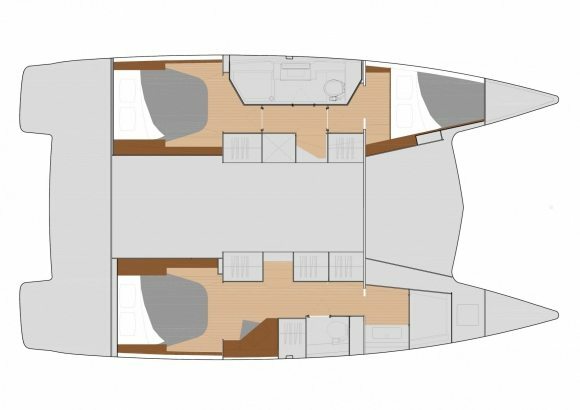 The three-cabin Maestro version has the entire starboard hull dedicated to a master suite that is nice and open. 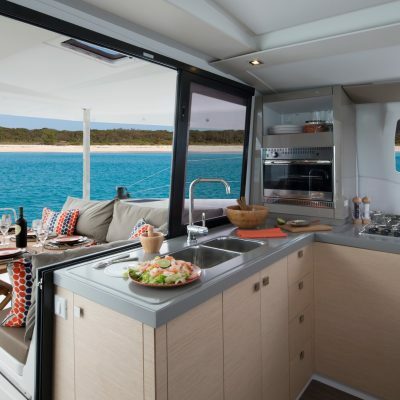 The large walk-around island bed aft is low and easy to get on and off. The central sofa is replaced with lockers that not only provide excellent stowage but can accommodate an optional washer/dryer. 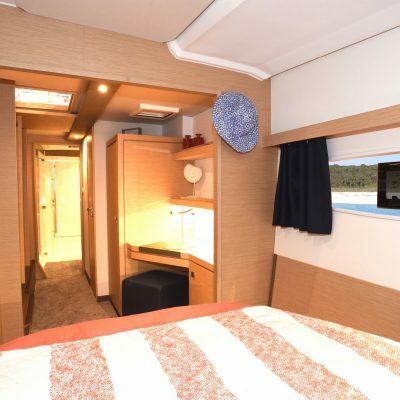 The toilet is in its own compartment, and the shower is enormous. 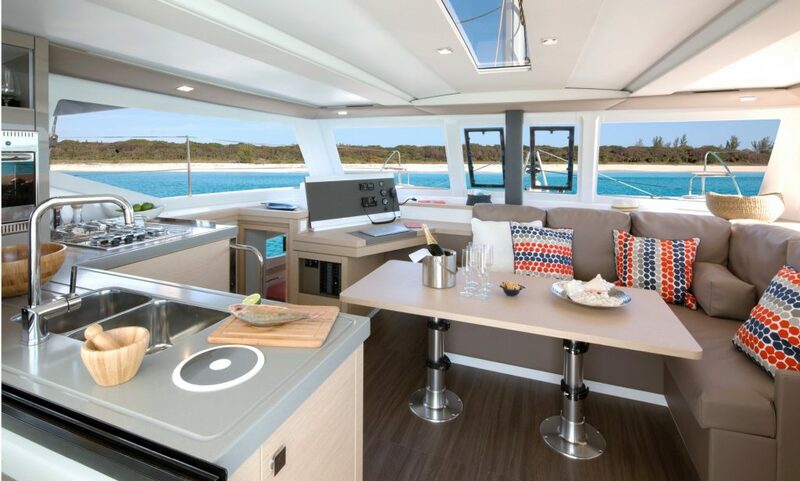 The Quator version has spacious double cabins fore and aft and a shared head and shower in each hull, but with the option of each cabin having their own dedicated head, the only 40 foot catamaran to offer this format. The very comfortable saloon is surprisingly spacious for a boat of only 40ft. 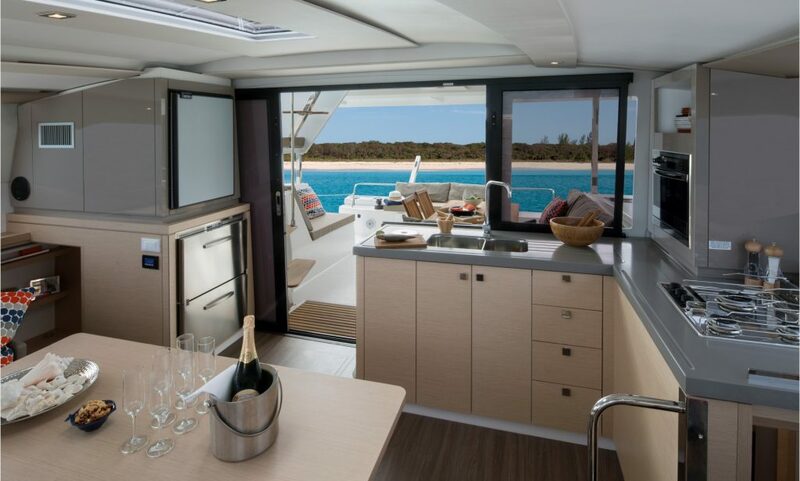 Glass doors open to reveal a cooking and socializing area on the same level as the cockpit. 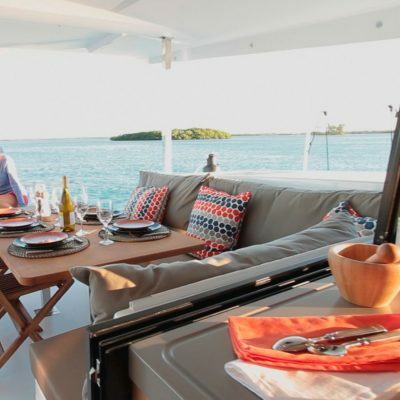 Six can sit at the L-shaped settee, which shares a seat with the dedicated angled navigation station. 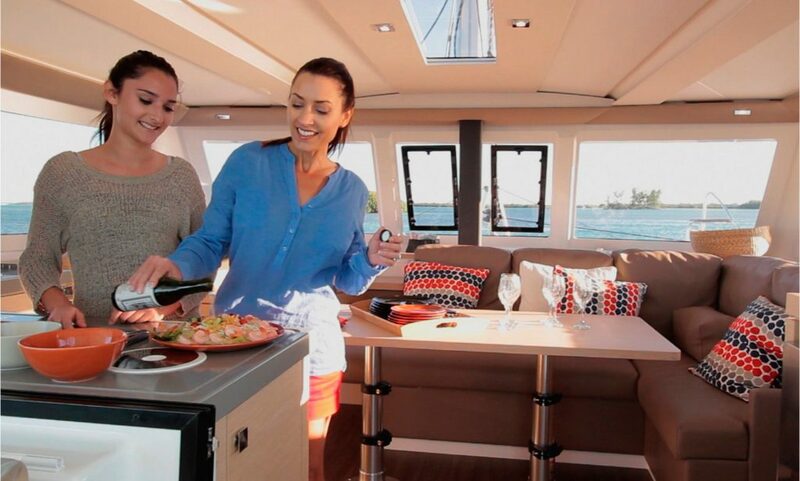 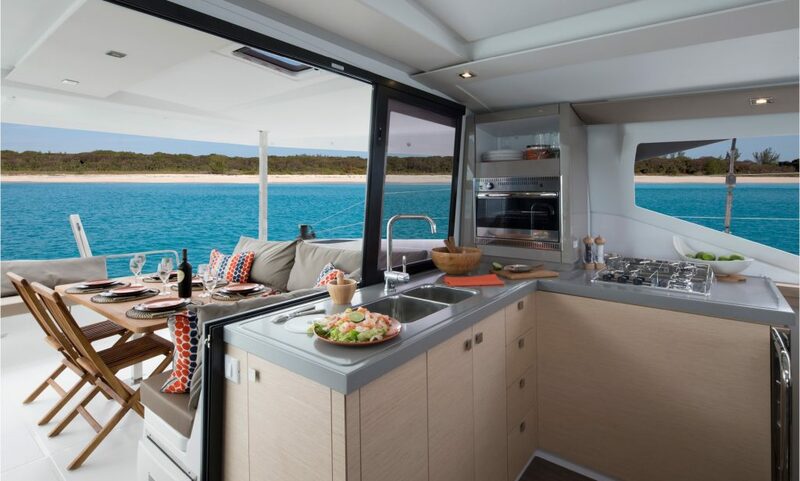 The L-shaped galley to port is well designed with a 3 burner stove, counter-height oven and sink by the aft window, which slides open for easy communication with the cockpit and helm. 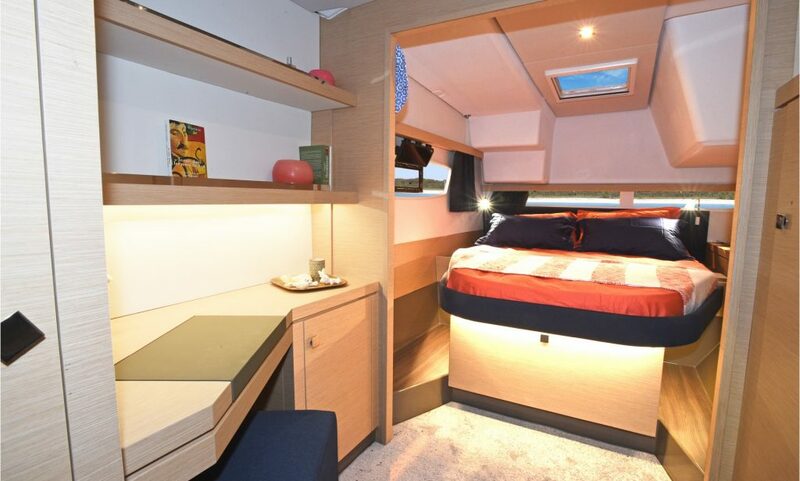 There are plenty of soft close drawers for storage. 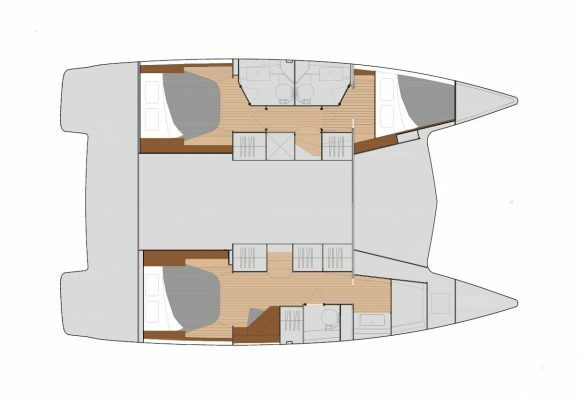 The large saloon windows and skylight brings in plenty of natural light and there are two forward opening windows to give ventilation at anchor. 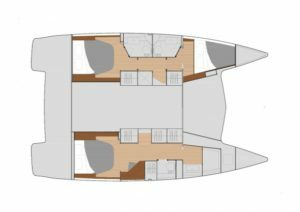 With a mast height of just under 64 feet and just over 1,000 square feet of sail area, she generates plenty of sail-power. 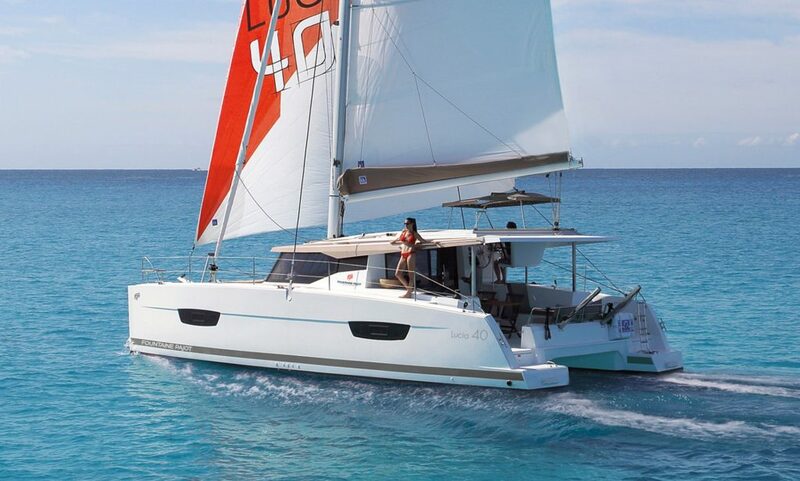 The Lucia 40 is balanced and responsive and offers a superb sailing experience as soon as the breeze picks up. 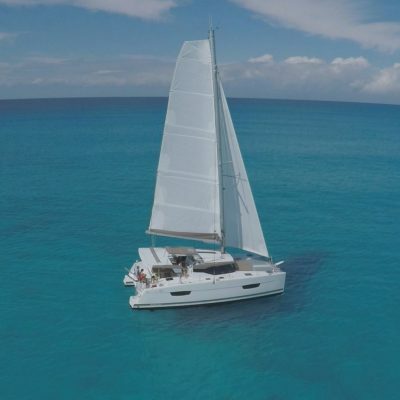 At less than 20,000lb she is light on her feet with 15 knots of breeze. 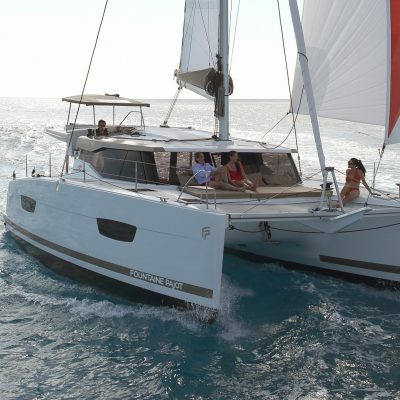 An optional bow-sprite and genaker is available for even greater off-wind speed. 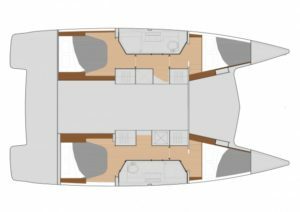 Performance under power is good but we suggest fitting the upgraded 30hp engines which will help when the sea is a little choppy. In smooth water top speed is over 7.5knots but at a fuel efficient speed of 6.5 knots at 2,300 rpm, the boat’s 80 gallons of fuel will deliver the greatest range.